That strange twist in my gut today: that’ll be the moon, I presume. That subtle weight that makes my breath come out in sighs: the moon. My restless sleep last night: the moon; the anxious dreams, the thoughts – unbidden – that unsettle me, the silence that I fill with fears: the moon. And if I draw my curtains aside: too bright, too eerie, too many shadows cast where there should be just night, too many details picked out in the negative space – the moon. Ostensibly, we strive for balance, and yet we give ourselves up to the mercy of the planets and the stars and the whims of heartless constellations. What equilibrium can we hope to achieve when we are tidal creatures, controlled by the moons and the spin on the earth? All those cosmic events, all that planetary action to explain, to justify, to forbid: and we are rendered helpless by our own choosing. Shadow puppets to those cold, distant bodies, our astral hegemons, dictating when and how. Full moon: review; new moon: now start again; when Mercury’s in retrograde don’t even think of trying, but make the most of Venus in your sign. Whenever you feel slightly askew, it’s probably something cosmic. 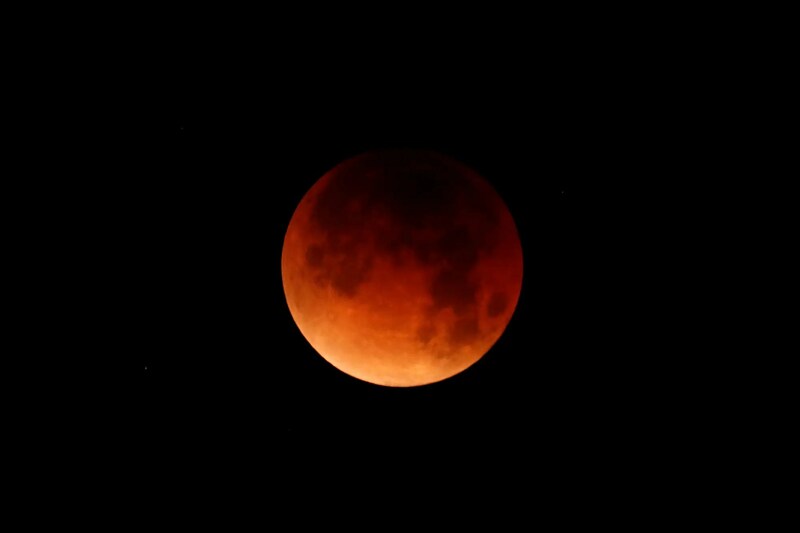 It is now the day after the Super Blue Blood Moon Eclipse. Last night, in defiance, I refused to be drawn and to draw my curtains aside; there were enough photos of the thing on facebook, anyway. Did it affect me, regardless, sight-unseen? Probably. Would I have acted differently, chosen different words, swapped one set of feelings for another if it had been another day in the cycle of the moon? Probably not. We cannot control our waters: we are tidal creatures. We cannot control the spin of the earth or how the planets move across our solar system. We cannot let those things control us, either. It isn’t Mars that causes conflict; it isn’t indecisive Libra that makes us put things off. It’s not the heat of the sun or the cold glare of the moon; it isn’t the eclipse that brings the darkness. We are not helpless; we don’t have to be. Perhaps our balance can be sought in remembering that we’re equally part of this earth that spins as of the cosmos that surrounds it, subject to both its gravity and the magnetic pull of those twinkling, meddling stars; that we are earth and water, fire and air as much as any other body in our skies. Acting the way we would, flighty Geminis or stalwart Capricorns regardless, and letting the moon rise and fall, letting it wax and wane without casting ourselves in its shadows. Perhaps our balance can be found in refusing, sometimes, to be drawn. Whatever the moon brings out in the negative spaces is there anyway, whether we shine a light on it or not. We’ll draw our curtains aside when we are ready to see.